Walk into the showpiece of Sean Farmer’s shop, Suits by Curtis Eliot, and you’d be forgiven for thinking you’d wandered into a spaceship. The Edmonton-based custom clothing company has forsaken the tailor’s signature tool, the tape measure, for a full-body scanner. Clients seeking a custom suit don tight-fitting clothing and walk into what looks like a revolving photo booth. As the platform spins, the scanner notes the client’s exact measurements. The data is used to create an avatar of the client, so Farmer and his designers can visualize exactly how the suit will fit once it’s made. The result, says Farmer, is a custom suit with a perfect fit. The scanner may seem futuristic, but Suits by Curtis Eliot shirks the most popular modern innovation for business owners: e-commerce. 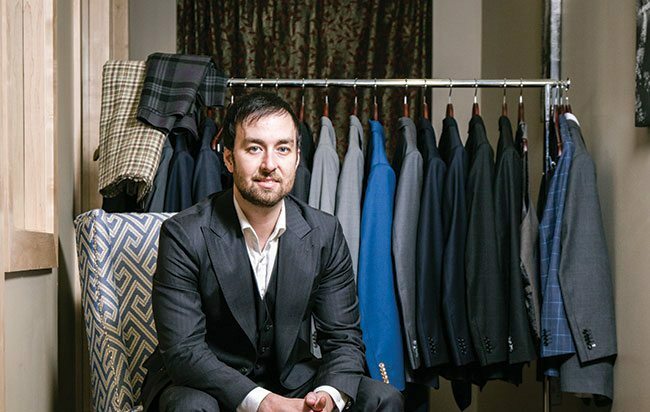 To order a suit, a customer must make an appointment to visit Suits by Curtis Eliot’s brick and mortar store in Edmonton, or one of its satellite shops in Calgary and Fort McMurray. There, they pick out their fabric and work with a designer to craft the suit they want. Moreover, Suits by Curtis Eliot has ditched its marketing budget, choosing instead to rely on word of mouth to grow its customer base. Despite that, Suits by Curtis Eliot is on track to nearly triple its year-over-year revenue. Farmer says he expects to bring in $1.4 million this year. He says his unique business model is at the heart of his success. Instead of making the suits in-house, and maintaining a large inventory of fabrics, Suits by Curtis Eliot manufactures its clothing at a factory outside Hong Kong. The fabrics are either stored there or at the source — at mills all over the world. Farmer has streamlined the process so customers can have their suit delivered within 10 days.